HYDE PARK — The Hyde Park Art Center announced the construction of new artist studios and unveiled a massive new installation piece to celebrate its 75th anniversary. “We’re thinking of it more as a collaborative work space,” said Kate Lorenz, director of the center at 5020 S. Cornell Ave.
Lorenz said a $750,000 gift from Julie and John Guida would allow the art center to convert storage space into studios for new artists. Julie Guida said she was looking for something positive to do in the community since selling her marketing business, Marketing Werks, to Crossmark last year. “For a long time, people were telling us that if you’re going to invest, invest in people, and at the art center it really is about people,” Guida said at an announcement of the new wing on Sunday. After the announcement, Guida and her husband wandered through a back storage area trying to imagine what it would look like filled with artists instead of crates and boxes when the studios are renovated in spring 2015. The new space, named the Guida Family Creative Wing, will partially be used by artists in the art center’s residency program. After the announcement, visitors were led down to the main gallery, where current resident artist John Preus unveiled “The Beast,” an enormous new installation. “I had been reading a lot about how violence and sacrifice was a unifying force and that culminated in this gigantic animal in the space,” Preus said. 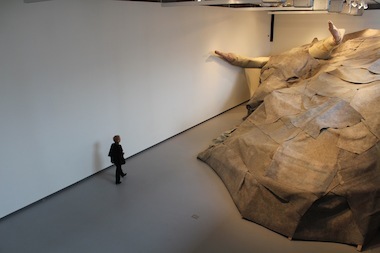 A fallen bull dominates the art center’s main gallery, its drab hide made of blankets layered over its nearly two-story tall frame. Walking through a doorway pierced in the neck of the bull, visitors wander through the corpse’s wooden skeleton to its belly, where the 2-by-4s arch upward to create a performance space. “The exterior I’m imaging as a spectacular decoy, the interior has this life of its own,” Preus said from inside the belly. During the opening Sunday, Preus’ experimental band played to a small crowd huddled in the bowels. During the show’s run through Aug. 3, the art center will host a weekly potluck on Thursdays in the installation and will open the area to community groups to hold meetings. The art center has events scheduled to coincide with “The Beast” throughout the summer, including story and art workshops every Saturday and an arts showcase on Mondays where artists talk about 20 of their works in less than 7 minutes. Preus said the concept for a community area inside the bull came partially from the Biblical story of Jonah’s period of contemplations after being swallowed by a whale. “I couldn’t have pictured it, but after I saw it, it made complete sense,” curator Allison Peters Quinn said. She said it was interesting to watch Preus’ vision come into form in less than five days as he crawled up the bull’s mammoth horns over the last week. The bull will be on display through Aug. 3. A full listing of events coinciding with the exhibit is available on the Hyde Park Art Center’s website here.